While the totals are still far lower than they were during the Vietnam War, when the draft was in effect, they show a steady increase over the past four years - and a 42 percent jump since last year. According to the Army, about nine in every 1,000 soldiers deserted in fiscal year 2007 (which ended Sept. 30), compared to nearly seven per 1,000 a year earlier. Overall, 4,698 soldiers deserted this year, compared to 3,301 last year. Nearly 64 percent of the desertions last year were reported from April to December, reports CBS News correspondent Sam Litzinger, which would suggest the pace is picking up. Sgt. Phil McDowell is one of those deserters. Now living in Canada, he had served one tour in Iraq and was getting out of the Army when Uncle Sam said "not so fast." "The reason I was being called back was to go to another tour in Iraq, and I didn't agree with that," McDowell told CBS News national security correspondent David Martin. McDowell could eventually be deported from Canada and court-martialed, but for him that beats going back to Iraq. "If I had been asked to go to Afghanistan I would have gone there," he told Martin. "But the Iraq War I didn't want to have any part of that any more." The rate of desertions seems to be accelerating in a pattern that tracks almost exactly with the extension of tours in Iraq from 12 months to 15 months. 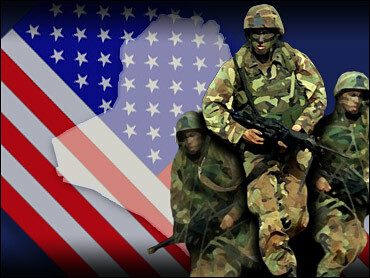 Analysts say the Army has borne the brunt of the war in Iraq. Marine and Navy desertions actually declined last fiscal year. Military leaders - including Army Chief of Staff Gen. George Casey - have acknowledged that the Army has been stretched nearly to the breaking point by the combat. And efforts are underway to increase the size of the Army and Marine Corps to lessen the burden and give troops more time off between deployments. Despite the continued increase in desertions, however, an Associated Press examination of Pentagon figures earlier this year showed that the military does little to find those who bolt, and rarely prosecutes the ones they get. Some are allowed to simply return to their units, while most are given less-than-honorable discharges. The report on rising desertion rates comes a day after two U.S. Army deserters who fled to Canada and sought refugee status on grounds of their opposition to the Iraq war lost their bids to have the Supreme Court of Canada hear their cases. The court refused Thursday to hear the appeals of Jeremy Hinzman and Brandon Hughey, who were rejected by Canada's Immigration and Refugee Board in 2005. Hinzman and Hughey deserted the U.S. Army in 2004 after learning their units were to be deployed to Iraq to fight in a war they have called immoral and illegal. Earlier this week, a soldier who served two combat tours in Iraq was arrested for leaving the Army without permission more than a year ago. The arrest occurred just hours after Sgt. Brad Gaskins spoke at a news conference saying he left his base in New York State in August 2006 because the Army wasn't providing effective treatment after he was diagnosed with post traumatic stress disorder and severe depression. "They just don't have the resources to handle it, but that's not my fault," Gaskins said. Last month, the Veterans Administration said more than 100,000 soldiers were being treated for mental health problems, and half of those specifically for PTSD. Gaskins, 25, of East Orange, N.J., was taken into custody at a Watertown cafe ono Wednesday by civilian police officers from Fort Drum and two local police officers, Ensign said. The lawyer said he had been on the phone with military prosecutors working out the details of Gaskins' surrender when the soldier was arrested. Fort Drum spokesman Ben Abel said after a soldier is AWOL for more than 30 days he becomes classified as a deserter and a federal arrest warrant is issued. He said he was unaware of the specifics of Gaskins' case and declined to comment on it. An eight-year Army veteran, Gaskins served two tours in Iraq and a peacekeeping tour in Kosovo. He said his mental health began deteriorating during his second tour in Iraq, which began in June 2005, when his job was to conduct road searches and locate improvised explosive devices. He said after returning to Fort Drum in February 2006, he began suffering flashbacks and nightmares, headaches, sleeplessness, weight loss and mood swings that took him from depression to irrational rages. Military doctors sent him to the Samaritan Medical Center in Watertown, where he spent two weeks and was diagnosed with PTSD. When he later asked his commanders about returning to Samaritan, they told him it would delay any chance he had at obtaining a medical release, Gaskins said. At the time, the Fort Drum mental health facility had a staff of a dozen caring for approximately 17,000 troops, Ensign said. Gaskins said that because he had been unable to get proper help, he requested a two-week leave and went home to New Jersey, where he has been living since. Gaskins said he hasn't been able to get a job because of his PTSD, and that he and his wife have separated. He said he has only supervised visitation rights with his two children.